ORF employs a wide variety of spam filtering technologies, such as DNS blacklists, SURBLs, Greylisting and many others to identify spam and other kind of unwanted email. ORF offers excellent spam filtering performance and it is configurable to every detail. 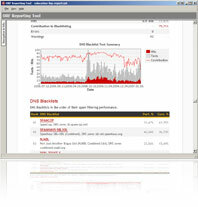 Unlike most of the competing products, ORF is licensed per server (with a single server license available for $239).